We can receive orders requests but when hit reply it does not open up, we have not had this problem before. How can we fix this ASAP as orders keep coming though. Can you please clarify where you are replying? Were you referring to replying to the email Notification? 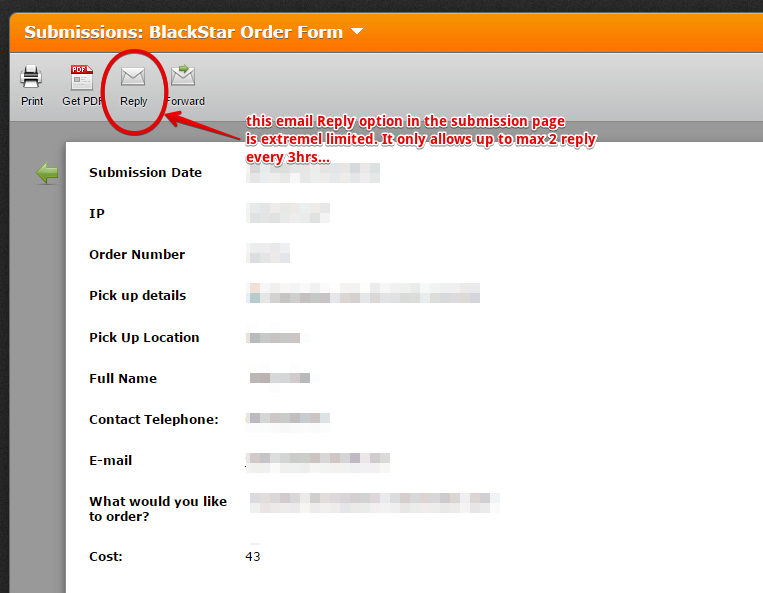 I checked your account/username blackstarchris and I noted that you have a lot of forms already. Can you tell us the URL of the form in question. We will check on this further. Please find our URL http://www.jotform.com/form/13190021799 . I am replying within the online Submissions. 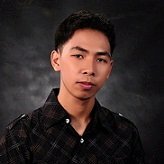 Thank you for providing to us the requested information. If I understand correctly now, you must be referring to the Reply button in the View Submissions page of the form. 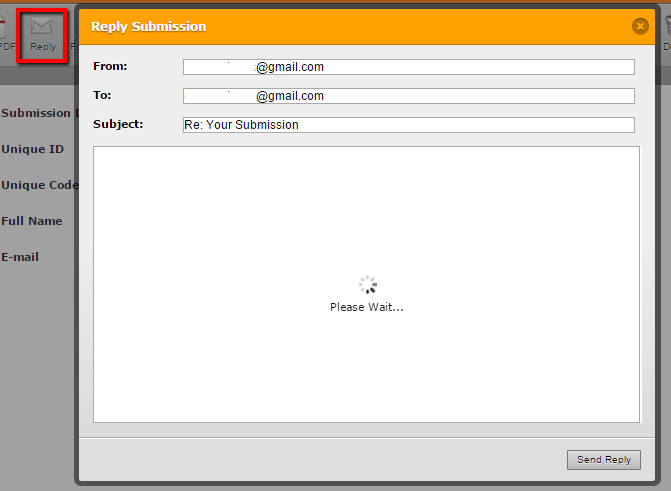 I would like to inform you that the Reply or Forward Email option in the submission page is very limited for use. 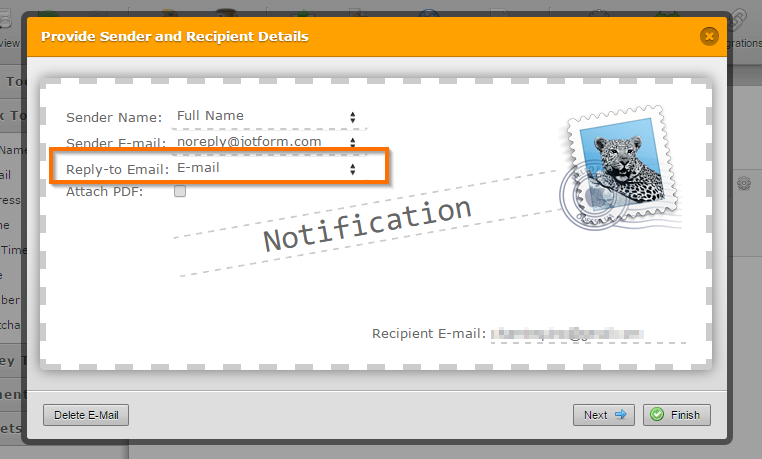 This is due to security measure to prevent using JotForm to spam email submission using those tools. You should use your email reader/client instead for replying to submissions email. We have been replying to our custom via the “reply” on the submission page for a couple of years now, around 10 reply an hour. Is this a new system that has just been put in place in the last 24 hours. By replying though jot form its self we find it the safes way to ensure that no customers order are missed. is there an other way around it so we don’t have to jump back and forward from jot form and our email account?. I tried this on my end and I noticed that the "Please Wait" message is stuck. See screenshot below. I just want to confirm if this the issue you are reporting? Please note that I was able to open the reply pop-up. However, the "Please Wait" message was stuck. Yes that was the problem that we encountered today. The reply window was stuck on “Please Wait”. I’ve just tested it again and it seems to work perfectly again. Thank you for your assistance. Probably just a temporary glitch. You can also reply on the submission through the received notifications, just make sure that the "Reply-To Email" in your settings is set to the email field. 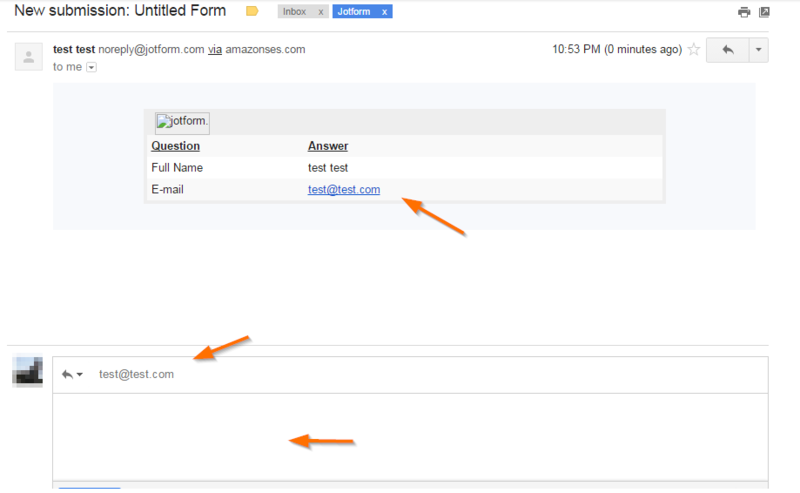 Here, I received an email notification on my test submission, I can directly reply on the email and that will be sent directly on the email that was filled out by the user. However, if you were able to experience the loading problem on the reply submission, please do let us know and we'll investigate it further. Help! Having the same issue! Please fix!! I see you already opened your own threads regarding this issue. Please refer to this link instead: http://www.jotform.com/answers/615509. We will address it shortly. New response receivedTHis link is broken! Apologies for the inconvenience. I will forward this to our developers to have it checked. We will update you in this thread when we hear any news. For the meantime, you can directly email back to your submissions using the email notification you received from your email client, as shown in my example above. Again, apologies for the inconvenience. The problem has just been fixed.